James Burke, after distinguishing himself as a midshipman in the British merchant marine, rapidly rises to the rank of executive officer, second in command of a ship. A broken foot necessitates that he be put ashore to heal. 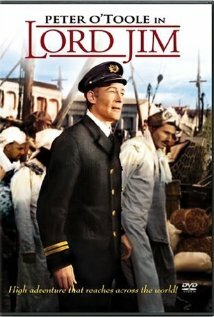 After his recovery, the very proud Jim - his pride rooted in his competence, which had made him a highly respected and admired naval officer - signs on as the executive officer of the Patna, a rusty tub manned by a third-rate crew overseen by a barbarous captain, that is transporting a group of Moslem pilgrims to Mecca. During a severe storm that causes the unseaworthy ship to founder, Jim abandons ship with the rest of the white crew without even lowering the other lifeboat for the passengers. The fleeing crew are prepared to swear they saw the Patna sink with all its passengers; however, in what Jim believes is a cosmic joke upon himself, it is revealed when they get into port on their lifeboat that the Patma did not sink but had been salvaged by a French vessel. In the ensuing inquiry that he himself sought to do penance for his sins (the ultimate sin for a naval officer being to abandon ship particularly when passengers or crew are still on-board), Jim is admonished after confessing his cowardice, chastised for bringing shame upon those to whom he belongs, the British merchant marine. His chief judge asks him why he did not "bury himself 20 feet deep" rather than seek the inquiry and humiliate himself and all professional British sailors. Jim does succeed in "burying himself 20 feet deep" by becoming a drifter and common laborer in various southeast Asian ports, though he never can completely escape into anonymity. The burden of his sin follows him everywhere. Racked by guilt over abandoning his ship, the proud Jim seeks atonement, a second chance, which comes in the guise of running arms and gunpowder to a tribe of indigenous peoples oppressed by a ruthless and brutal warlord. The warlord knows that the difference between a hero and a coward is not as thick as a piece of paper. What will this mean for Jim, now committed to a heroic path for a people whom he does not even know? The man the natives soon call "Lord Jim" is about to face his destiny, which is relentless and inescapable.